We had SO much fun with our giveaway last month (Congrats, John!) that we knew we had to come back with one more before we send off 2016! This gift card might not get to you until right after Christmas but think of all the Disney items you’ll score on sale! If you’re still looking to buy for that Disney nut in your family (or maybe it’s you – hey, no judging, we ALL need to get our Mickey Fix on!) then don’t forget to check out all our Disney Gift Guides! The giveaway will end on December 22nd, 2016 at 11:59 pm. The prize will be provided by Mickey Fix. We will confirm that you are a subscriber of the Mickey Fix newsletter. 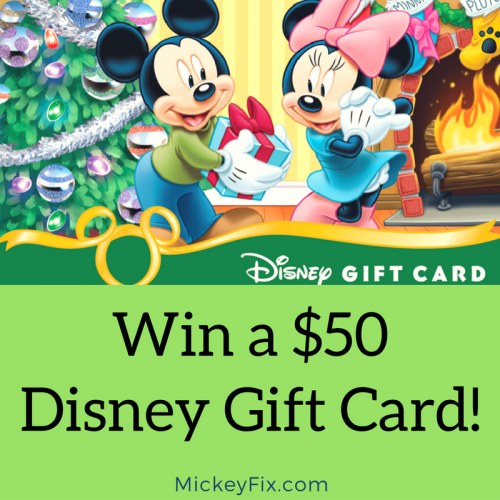 Mickey Fix is not affiliated with the Walt Disney Company or its subsidiaries. United States only. I’m already a subscriber! Love it! would really come in handy during my honeymoon! Been following this site for some time now. Lots of fun information. I love Mickeyfix. Especially the photos you put up occasionally! Already a dedicated subscriber:) Visited your FB page too! I visited Mickey Fix on Facebook!! I would love to win the gift card we are going to WDW in March. I visited your Facebook page and I also like and follow you. Love Mickey Fix! I’m a subscriber. Subscribed, visited Facebook, and followed on Twitter! Subscribed and liked! I love Disneyland! Subscribed, visited and liked on Facebook! Forgot to say I subscribed! I already subscribe. Great Newsletter! Visited your Facebook page and “liked” you! Visited fb page and subscribed. Subscribed and heading to Facebook now. I’m already a subscriber and would love a gift card!! I learned about you folks from Disney Food Blog sharing your post. I signed up for your newsletter! I just liked you all on Facebook as well! Woo-hoo! I followed you on twitter as well to complete my social media Disney stalking 🙂 do you have an Instagram too? My husband let me know about this website and contest. I signed up for your newsletter! Been a subscriber for awhile. Love you guys! Been a subscriber for years. Also “liked” on Facebook. Would love a gift card to spend on our 2017 trip to my other home, WDW Orlando!! i’m a subscriber and fascinated with Disney! Already a subscriber because I always need a Mickey Fix! Just made sure to visit the Mickey Fix facebook page as well! I actually just recently joined Twitter, so now I can follow Mickey Fix on there too! And I did 🙂 that’s three different Mickey Fixes…that’s a whole lot of Mouse and I LOVE it! Current subscriber and liked on facebook. Current subscriber – always need a Disney fix! I just got back from visiting disney for the very first time. It was wonderful!!! Happy Holidays! Visited Mickey Fix on FB. I follow on Facebook and paid the page a visit today! I subscribed to the Mickey Fix newsletter! Subscribed and viewed on Facebook. I visited Mickey Fix on Facebook. I subscribe to the newsletter. Facebook page visited & liked. Already subscribed. Thanks for the opportunity. Visited Facebook and already like the page! Subscribed, and please pick me! Thank you. I visited on Facebook and already like the page! I have a Newsletter Subscription. I follow/have liked you on FB. I already subscribe to the newsletter!! I visited the Mickey Fix Facebook page and liked the post about the giveaway! I already follow Mickey Fix on Twitter! Love to follow you on Twitter! That’s how I found this Give-away. Thanks for the opportunity. newbie here, signed up and ready to see all things Disney! And I just became a fan on Facebook too! I already subscribe! Please enter me into the contest. Merry Christmas!! Happy to have subscribed, thanks! I love all things Mickey! Subscribed and followed! I already like the Facebook page so I can see all th updates. Followed Mickey Fix on Twitter! Already a subscriber and really enjoy this informative newsletter. Found this just in time to enter. Found through the DFB newsletter. Saw your ad on Disney Food Blog so here I am. Going to Disney World soon. Always like more info. Just liked the Facebook Page. Me gusta el facebool @MickeyFix. Quiero una preciosa corona de magic bands como la del muro..!! I’ve subscribed. Thanks for the chance! Ya te sigo en Twitter Mickey Fix!!! I subscribed and looking forward to it! I checked out the Mickey Fix Facebook page!! Heard about this on the Disney Food Blog! Amazing!! I visited Mickey Fix on Facebook too! Just signed up… love Mickey! I’m already a subscriber. Thanks for the chance to enter. I already subscribe to Mickey Fix and I love it! I’m already subscribed and LOVE Mickey Fix! I visited your page on Facebook ! I followed your page on Twitter. I’m a new subscriber! Thank you. I checked out Facebook too! I’m already subscribed – Love It!!! Looked at the fb page! Already a subscriber and love getting the emails! Thanks for this contest !! would love to win the giftcard !! visited your facebook page !! Have been following y’all for a long time on twitter !! I visited your MickeyFix Facebook page. I follow MickeyFix on Twitter too! Already following on Facebook too. Love you guys!